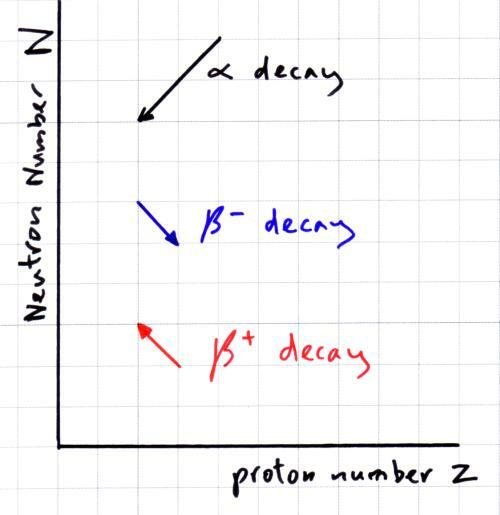 Radioactive decay occurs because a nuclei is unstable. It emits alpha particles, beta particles or gamma rays to become more stable. Z is the proton number (sometimes called atomic number) it is the number or protons in the nucleus. A is the nucleon number (some times called mass number) it is the total number of protons AND neutrons in the nucleus. 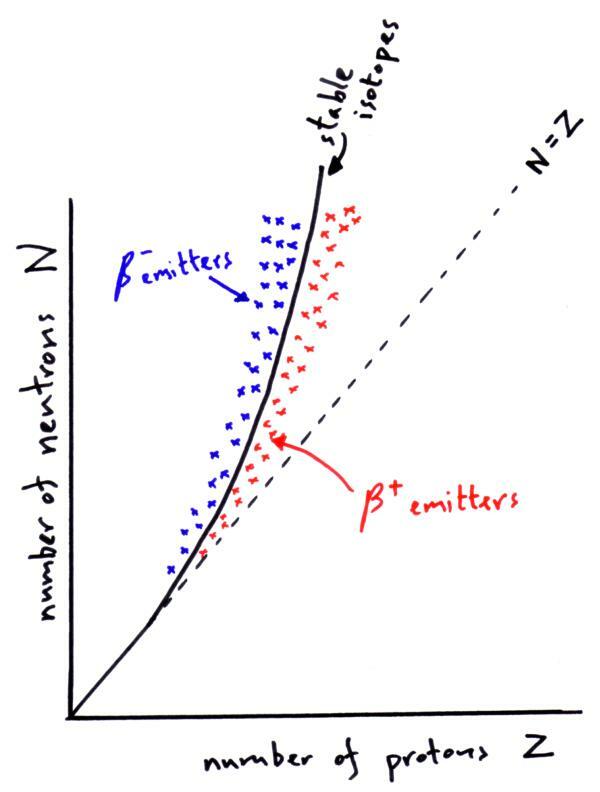 Graph of N against Z. In alpha decay the unstable parent nuclei emits an alpha particle (2 protons and 2 neutrons) so the daughter nuclei has 2 less protons and 2 less neutrons. In the parent nuclei a neutron changes into a proton and emits a beta- b– particle (electron). So the daughter nuclei has one less neutron and one more proton. In the parent nuclei a proton changes into a neutron and emits a beta+ b+particle (positron). So the daughter nuclei has one less proton and one more neutron. In electron capture a proton captures and orbiting electron and the combines to form a neutron. So the daughter nuclei has one less proton and one more neutron. Gamma ray emission may happen at the same time as alpha or beta decay or it may occur a short while after. The nuclei becomes more stable in gamma ray emission by emitting a photon. There is no change in the number of protons or neutrons when a gamma ray is emitted. Technetium-99m (the ‘m’ refers to the nucleus being in a metastable state) is used in medical diagnosis as a gamma ray sources because it has a half life of 6 hours which is a gives enough time for the measurements to be taken in hospital before the activity of the technetium decays away.